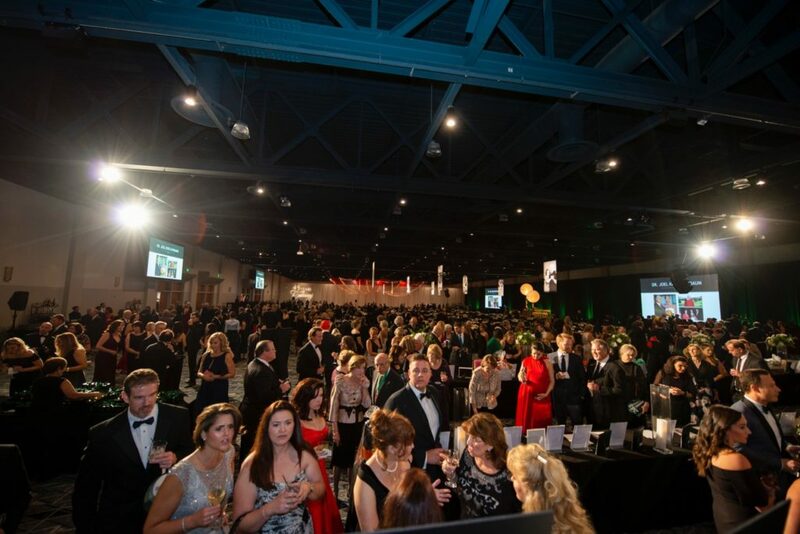 THE WOODLANDS, TX (Monday, October 8, 2018) — The Woodlands Celebration of Excellence Gala, themed “45 Years of Caring,” welcomed 750 guests at The Woodlands Waterway Marriott Hotel & Convention Center Saturday, October 6. 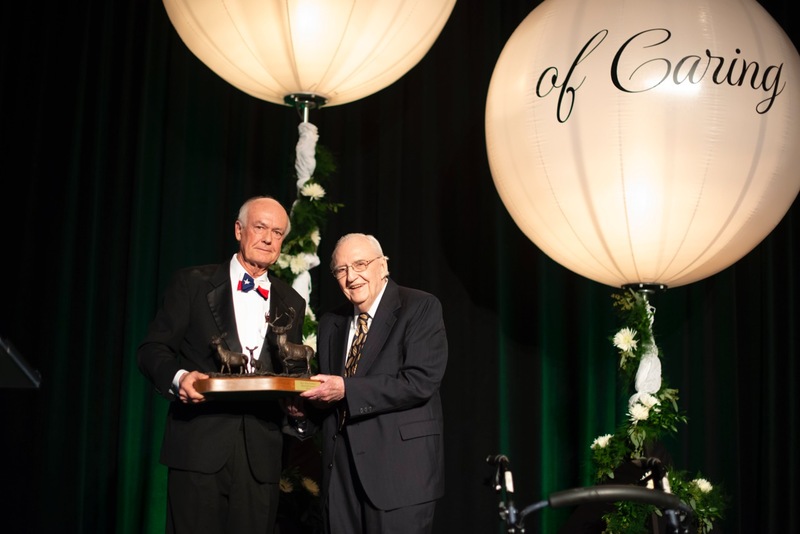 The 19th annual event, co-chaired by Shirelle Chimenti and Elvira Graham, was dedicated to honoring the 2018 Hometown Heroes and celebrating Interfaith of The Woodlands’ 45th Anniversary. This year’s event raised $750,000 for crisis assistance in South Montgomery County. Upon arrival, guests entered a beautifully lit ballroom filled with photos depicting Interfaith’s legacy of caring since it began in 1973. 11-year old harpist Elizabeth Howard entertained the guests with beautiful music while they enjoyed the silent auction and cocktail reception. 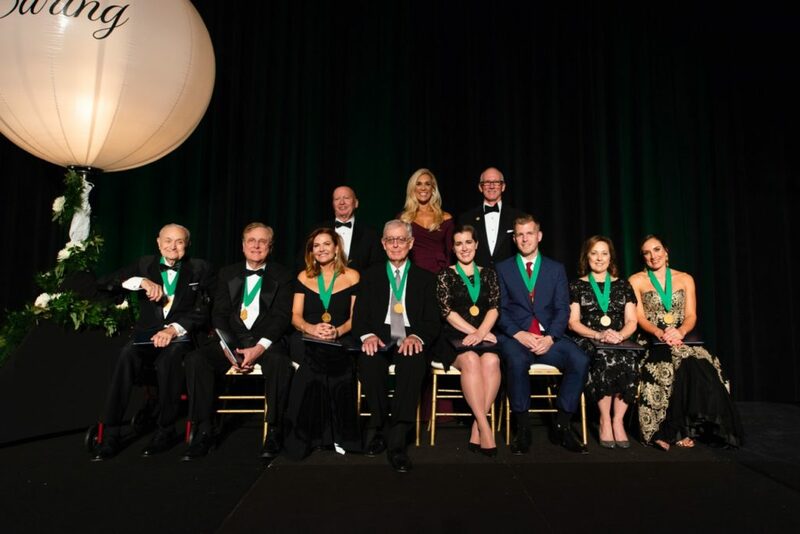 Rob Johnson, President of Interfaith’s Board of Directors, welcomed guests alongside Missy Herndon, President and CEO of Interfaith of The Woodlands and celebrated Honorary Co-Chairs, Ann and Jerry Snyder. Since 1999, Interfaith has recognized local heroes in the community by presenting them with the title of Hometown Hero. Touching videos played on the screens, reflecting their contributions in making a difference in the community. Congressman Kevin Brady presented each hero with a medallion and a Congressional Commendation. 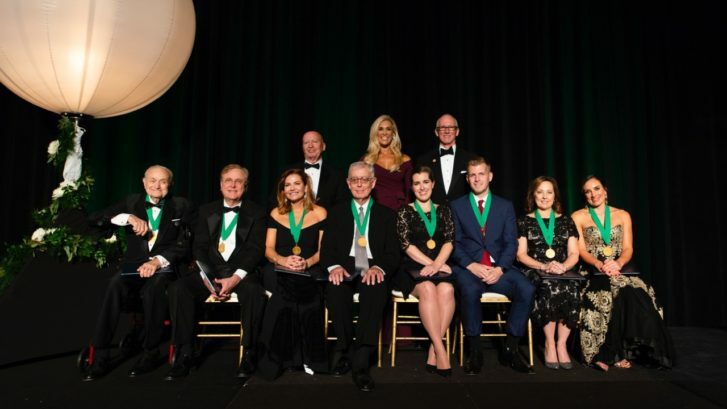 This year’s recipients were Dr. Joel Reed, Robert Heineman, Patti Rivela, Steve Leakey, Mrs. Brynn Ballard Huntsman and Mr. Peter Riley Huntsman, Entergy Texas Inc. and Junior League of The Woodlands. The event offered fantastic live and silent auctions, featuring numerous excursions and unique items. Mark Pharo Extraordinary Jewels provided a 24 karat gold necklace featuring 16 multi-colored gemstones that one lucky winner claimed. Interfaith typically serves 1,100 clients in crisis monthly, with those numbers expected to increase as the Holiday Season approaches. Gala guests were among the first to view a video testimony from a client who fell on hard times and utilized the many programs and services at Interfaith to help her and her family get back on their feet. The impact of this storytelling was felt throughout the room as attendees were asked to lend their support. As each guest made a donation, they were handed a candle that was raised in homage to the thousands of clients Interfaith has assisted since opening its doors in 1973. Interfaith of The Woodlands is a nonprofit social service agency providing programs and services to meet the needs of The Woodlands and the surrounding area. Interfaith provides basic needs assistance and special programs to families experiencing a financial crisis, and supportive service through care and wellness programs to senior adults 62 and over, in addition to many community programs dedicated to improving the lives of individuals in need. For more information on Interfaith’s programs and services or to become a volunteer, please visit woodlandsinterfaith.org or call 281-367-1230. Alex Sutton, Co-President of The Woodlands Development Company, presenting the Mitchell Award to Reverend Don Gebert, Executive Founder of Interfaith of The Woodlands. Congressman Kevin Brady, Interfaith President and CEO, Missy Herndon, Interfaith Board Chairman Rob Johnson with 2018 Hometown Heroes. Fulfilling the vision of building a more loving and caring community through service, Interfaith’s Programs and Services works with member congregations, corporations, organizations, individuals and other social service agencies to continue Interfaith’s tradition of helping those in need who live within our service area: 77380-77386, 77389 and 77375 in the Village of Creekside Park, and 77354 in the Village of Sterling Ridge. All programs are developed out of community need, and Interfaith’s staff is dedicated to providing outstanding service to our neighbors in need. Copyright © 2019 Interfaith of The Woodlands. All rights reserved. Interfaith Family Services provides holiday gifts to families through our Adopt-A-Family program. Beginning in October, families are interviewed and asked to provide one $50 gift idea and one gift card request valued at $25 for each child. Our program also furnishes each family with a $25 gift card so that they may buy something for their homes. The total cost of adopting a family with one child is approximately $100, with an additional $75 cost for each additional child in the family. We also ask that you include gift wrapping supplies. We will have both small and large families available for adoption. Interfaith’s Holiday Toy Drive is a program in which the community comes together to donate new toys and gifts for children and teens. These gifts are collected by Interfaith and distributed from a local fire station. Families requesting assistance come to the station and choose from a wonderful selection of new toys and gift items for their children. This is a wonderful opportunity for families in need to ensure that their children will receive gifts during the holidays. Each of the families receiving Holiday assistance is given three bags of groceries plus a turkey or a grocery store gift certificate for a turkey. Interfaith of The Woodlands Senior Services provides gifts to seniors who are in need. Beginning in September, seniors are asked to provide Interfaith with a $35 gift idea. In addition to this gift, each senior is given a $20 Wal-Mart gift card. With these guidelines, the total cost of providing a holiday gift for a senior is $55. ADOPT-A-FAMILY: To purchase gifts for a family, we can match you or your group with a family and provide a list of gift ideas that the family has shared with us. Gifts are due to Interfaith by 3:00 p.m. on Friday, November 30th. INTERFAITH HOLIDAY TOY DRIVE: If your business or organization would like to hold a toy drive, we can provide you with a list of gift suggestions. Please contact us so that we can help facilitate the collection and drop off of these items. We can also provide you with an Interfaith Toy Drive Collection Sign and collection box, if needed. Gifts are due to Interfaith by 3:00 p.m. on Wednesday, December 14th. ADOPT-A-SENIOR: If you would like to purchase a gift for a senior, we will provide you with a gift idea that the senior has shared with us. Gifts are due to Interfaith by 3:00 p.m. on Monday, December 3rd. HOLIDAY FOOD ASSISTANCE: You can organize a food drive and collect non-perishable items to fill our pantry shelves or coordinate a turkey drive for the main dish for the holiday meal. This is a wonderful time to collect holiday meal food items. If grocery store gift cards are donated, please request $10 increments. GIFT CARDS: We will be accepting Wal-Mart gift cards in $20 increments and grocery gift cards in $10 increments to distribute to our families and seniors for holiday assistance. For more information, please call 281-367-1230. Thank you for helping Interfaith make the holiday season merry and bright for our neighbors in need! For more information, contact Raymona Lewis of Interfaith of The Woodlands at 281-367-1230, or contact Becky Villarreal of CarePartners at 713-682-5995.